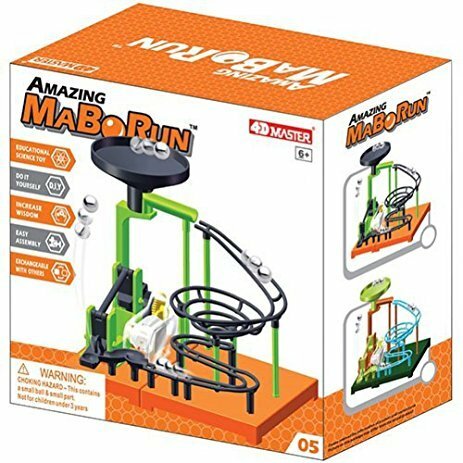 The Amazing Shooter MaBoRun features a fully-functional and impressive catapult that fires the marbles directly into a funnel slide at the top of the ramp to begin their descent through a short but exciting track with twists and turns! This amazing play set comes with its own unique tracks and obstacles, but each is fully interchangeable with all other standard-size MaBoRun sets, so that you can combine, link, and customize your very own runs, and learn about and observe mechanical and dynamic sciences with your friends and family. This particular run features marble shooting action via the catapult, the marble-collecting funnel up top, a spiral vortext trap, an s-wave track, and a transparent gear box that lets you observe the mechanical functioning of the catapult that powers the run! Easy assembly and simple parts with lucid instructions will allow your child to build confidence and independence as they construct their own exciting marble run! Makes an excellent gift for any occasion. 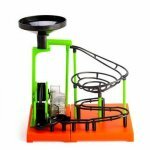 Build your own exciting marble run with a catapult that launches your marbles to the funnel at the top of the track!